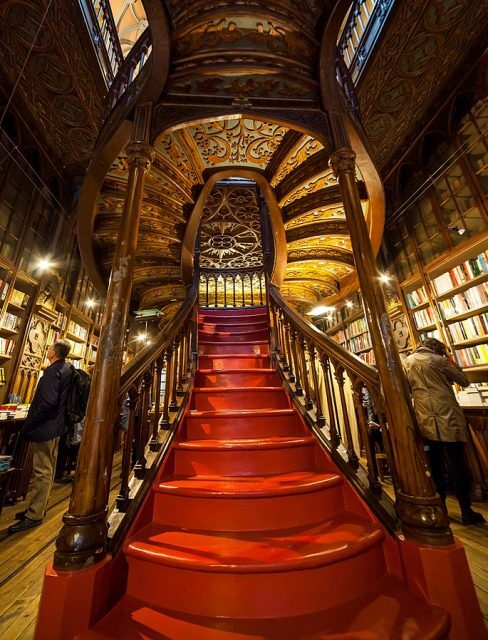 One of the world’s most stunning bookshops is more than just a shrine to the printed page. It is rumored to have inspired much of the Harry Potter oeuvre. But don’t mention that to the booksellers, unless you’re willing to risk a wizard’s curse. 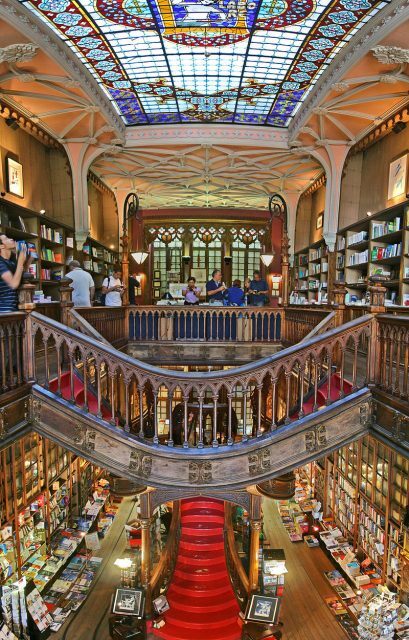 Livraria Lello lies in the heart of the Clérigos neighborhood of Porto, Portugal’s second largest city, on the Iberian Peninsula. 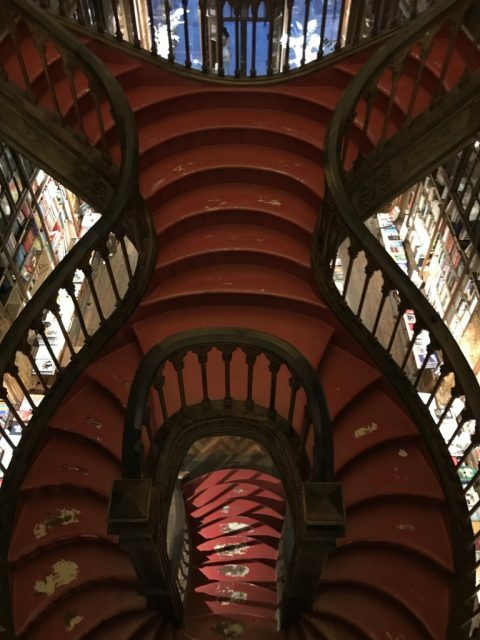 Clérigos was once graced by throngs of bookstores; many today have been converted into restaurants, wine bars, and even one sardine shop. 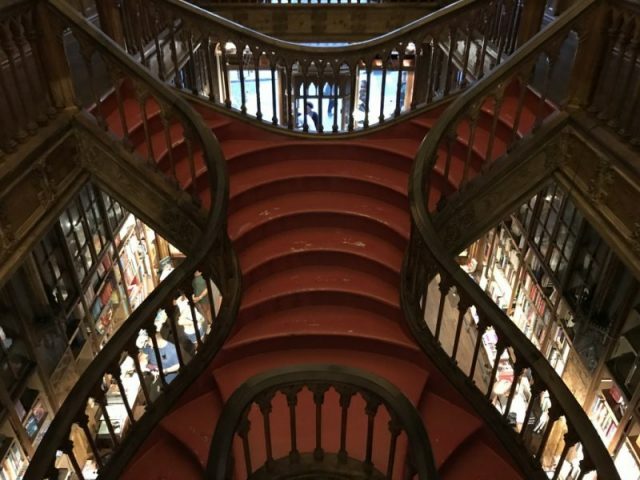 But Lello has survived and thrives as an independent bookstore and a major tourist destination, thanks to whom it inspired. 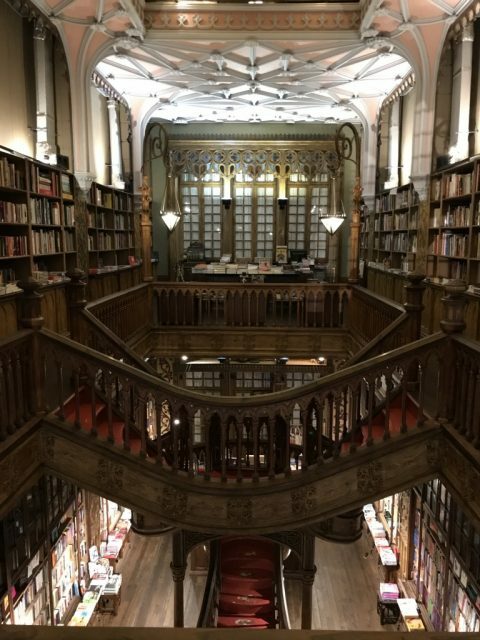 Right at the back of the store, through the glass paneled doors behind the main staircase, is where book restorers, maters of their craft, work their own kind of magic on old and rare books. 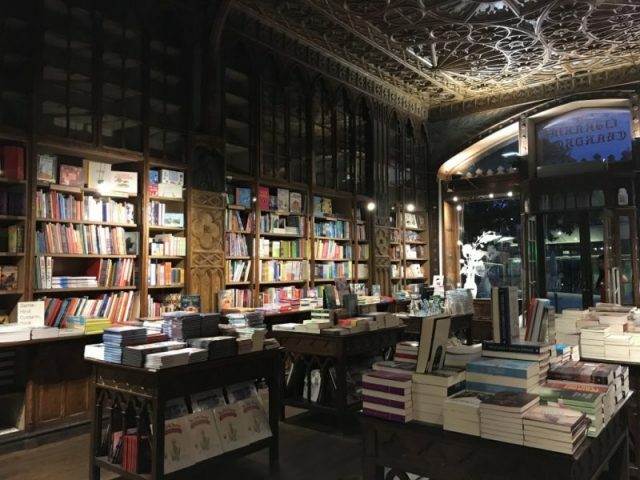 The Neo-Gothic bookstore opened its doors in 1906, the passion project of brothers José and Antonio Lello, who were heirs to olive oil and port wine fortunes. 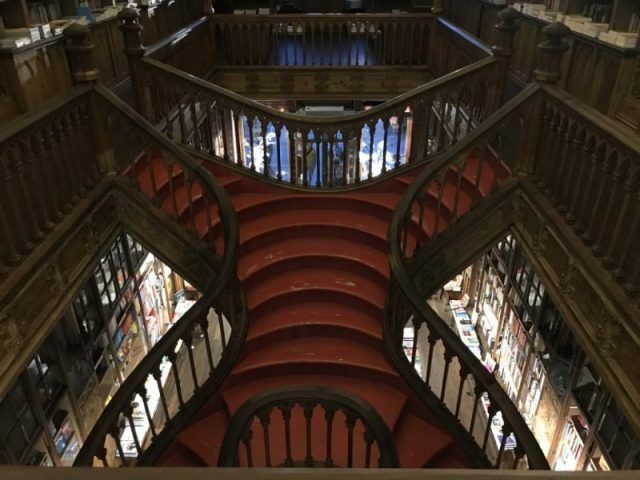 The staff of Livraria Lello still use an old-fashioned cart to move the books around – it runs on the narrow track visible on the floor in this picture. A decade or so prior, the bourgeois brothers—literature lovers—had purchased a bookstore nearby, called after its founder Chardron. But the brothers craved a grander showcase for their wares, a place where the era’s intellectuals could meet and mingle. 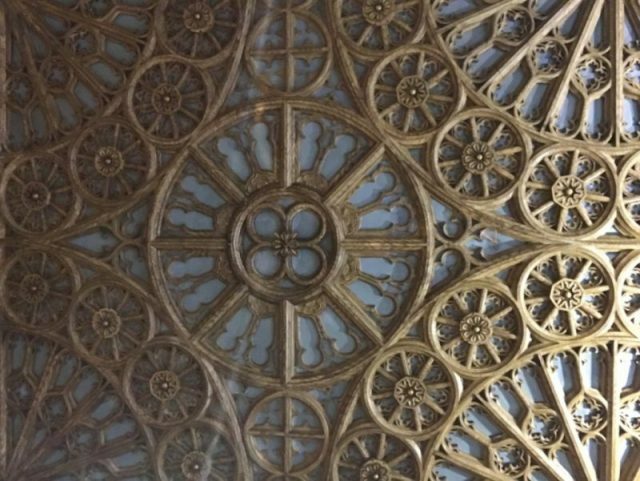 Furthermore, knowing that much of the Portuguese populace was at the time illiterate, the brothers, wishing to encourage literacy, wanted to build an extravagant edifice that would lure people in. Topped with spires, from the outside Livraria Lello does look like a cathedral, and indeed it is a sanctuary of sorts for the written word. 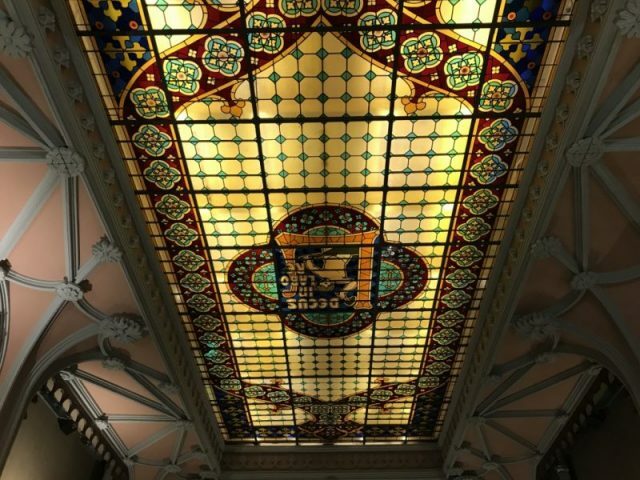 The second floor of the Lello Bookshop, with the decorative plasterwork and stained glass ceiling above. 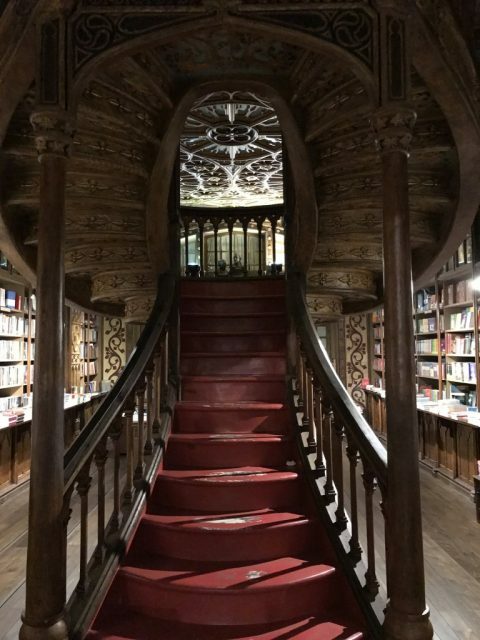 Could this be where the magical books come to life at night? The open two-story floor plan features stained glass windows and ceiling, ornate wood balusters, and a gleaming, curving, red-carpeted staircase. 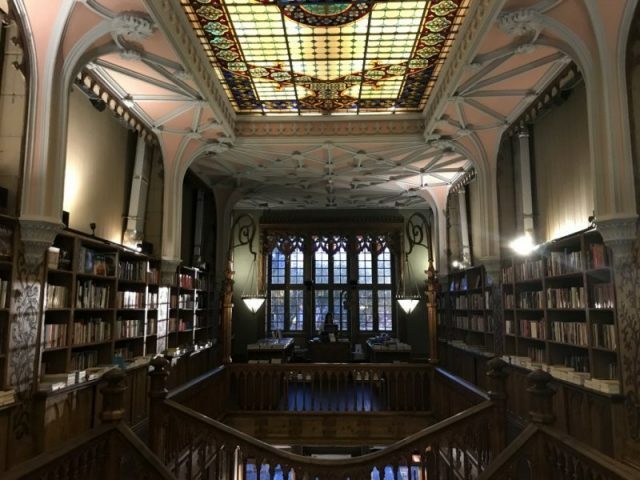 When the store first opened, the Lello brothers published, printed, and sold books, becoming something like ambassadors of Portuguese literature. 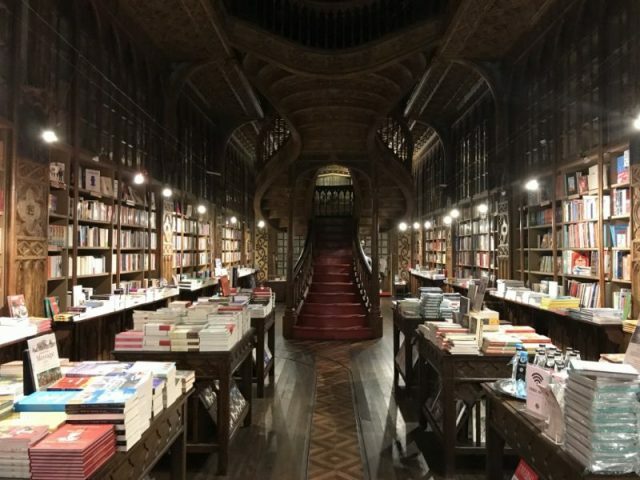 Today, the bookstore attracts so many worshippers that it charges an admission fee of 5 Euros (deductible against the purchase of a book); the line to get in sometimes snakes down the street. Many have come to see what they believe to be the inspiration for Hogwarts. J. K. Rowling taught English in Porto during the early 1990s when she was first dreaming up Harry Potter and his pals. At least two employees remember her as a customer, according to the New York Times. In Porto, Rowling met and married a television journalist with whom she had a daughter. 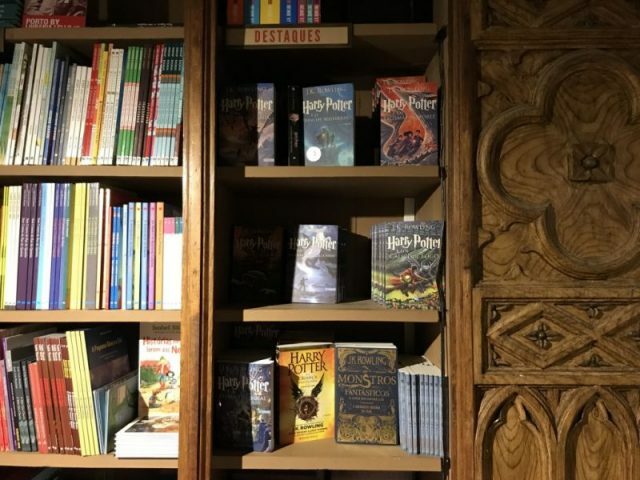 The books in this unique gem are arranged just like in any other bookshop. 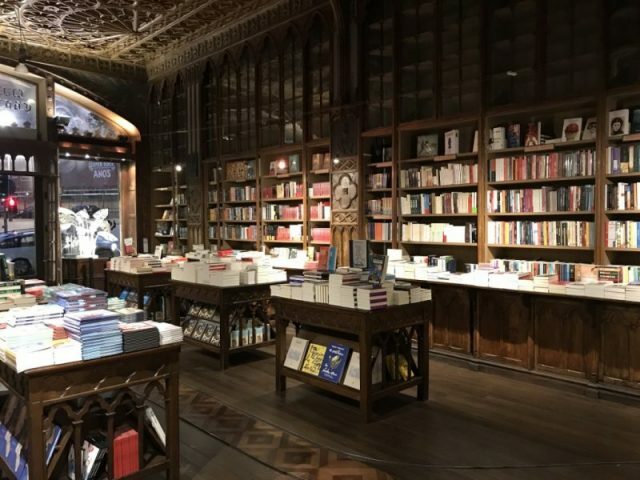 But no other bookshop has quite the same vibe. Rowling left Porto for Edinburgh, Scotland, to live near her sister. She took her baby with her, as well as seeds of future fame and fortune, though they would take some time to emerge—three chapters of what would become Harry Potter. 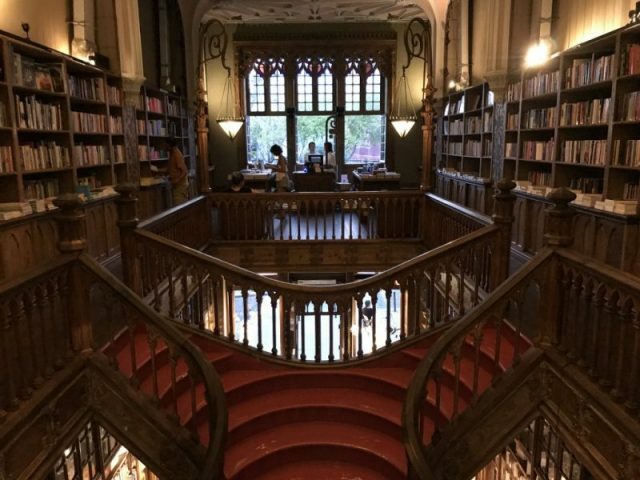 It’s hard to miss the magical similarities between this ornately chiseled bookstore and Hermione’s beloved library at Hogwarts, as well as the Flourish and Botts bookshop, where aspiring wizards picked up magic manuals. 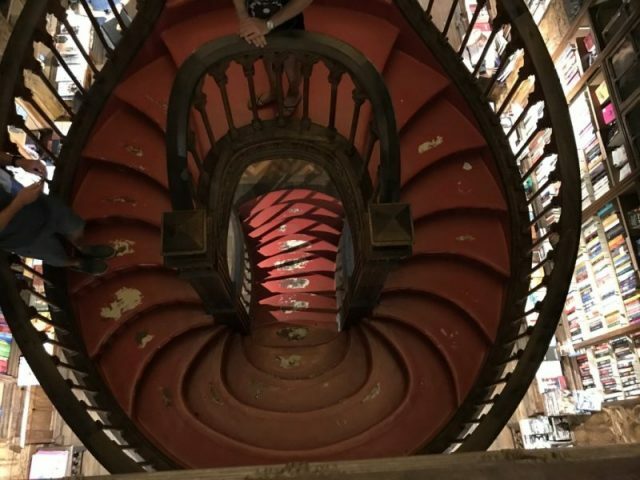 The dominant winding staircase feels like an obvious inspiration for the moving staircase at Hogwarts. 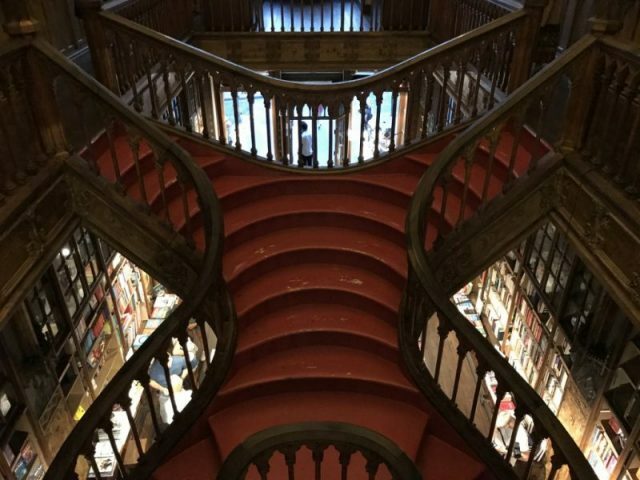 Look up at the highest glass-fronted shelves on the first floor of Livraria Lello. These are packed full of old and intriguing looking books. The city of Porto had likewise fallen on difficult times at the end of the 20th century, before its renaissance. Picture Harry Potter’s feet peeping from the bottom of his invisibility cloak as he sneaks into the forbidden section of Hogwarts library. But in anticipation of Portugal’s hosting the 2004 football (soccer to Americans) championships, the airport serving Porto was refurbished into a state-of-the-art facility, becoming a hub for direct international flights. With its rich architectural history and charming cafes serving superb local food and wine, the city has landed on Best European Destination lists several times in the past decade. 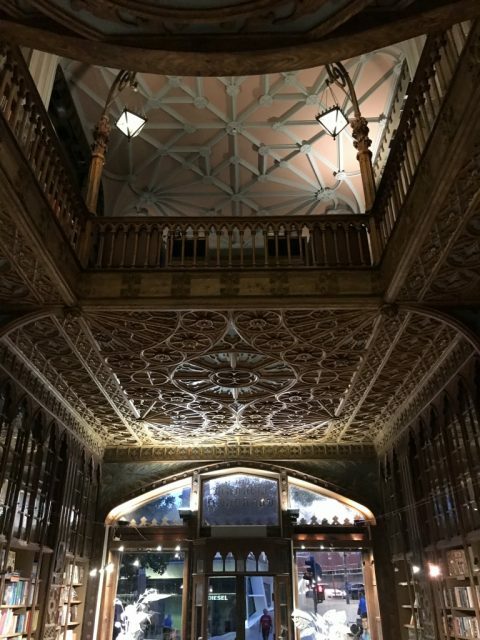 At Livraria Lello, visitors wait in line to get in from the store’s opening at 10 a.m. to closing (7:30 p.m. on weekdays; 7:00 p.m. weekends). 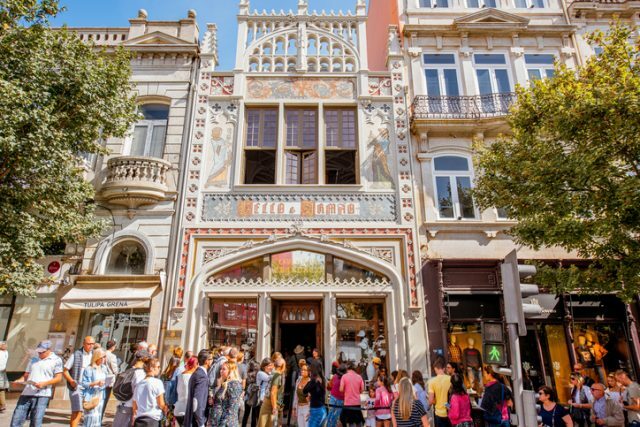 PORTO, PORTUGAL – September 24, 2017: View on the Lello Bookstore facade with tourists waiting to enter. 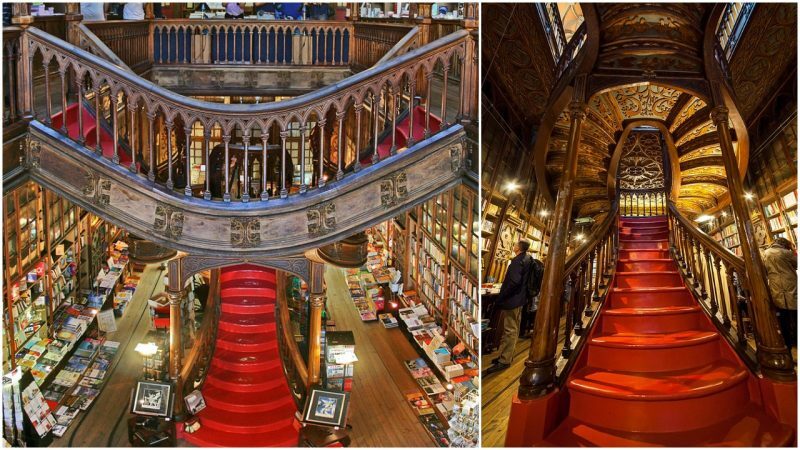 It is one of the oldest bookstores in Portugal. It can get crowded, and you may be jostled by selfie-takers, which is what makes the clerks a little cranky. Those not lucky enough to have scored a ticket peer through the windows at off hours. 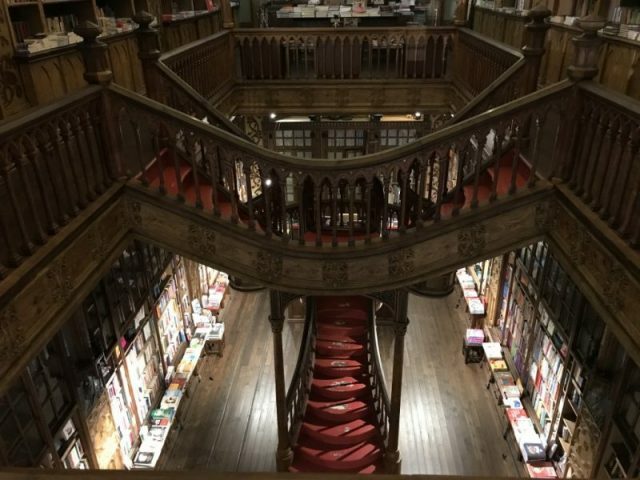 As you stroll the streets of Porto, you’ll see tourists proudly toting their bookstore purchases in distinctively logo-ed Livraria Lello bags. And if you’re lucky, you might even spot students of the nearby Porto College. The sophomores wear dark suits and black capes. Capes! Hmmm, doesn’t that sound a lot like … Harry Potter at Hogwarts?